Westin La Paloma Resort & Spa – Tucson, Ariz.
Come help us celebrate and support Southwest community tennis in a big way on November 18-19, for the 2011 USTA Southwest Annual Meeting, Hall of Fame & Awards Banquet held at the beautiful Westin La Paloma Resort and Spa in Tucson, Ariz. 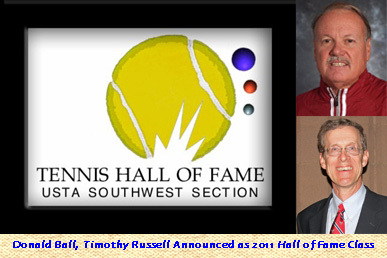 This year’s meeting will be a celebration of all things tennis in the Southwest as we hand out our annual awards, induct our two newest Hall of Fame additions (former New Mexico State University men’s and women’s tennis coach Donald Ball and longtime Phoenix-area volunteer Timothy Russell) and hold our largest annual fundraiser for tennis in the Southwest. The 2011 USTA Southwest Annual Meeting will also feature the announcement of our newest Executive Committee slate of volunteer officers from outgoing USTA Southwest president Beverly Bourguet. Our annual celebration is open for anyone who loves tennis to attend. Cost for the event is $60, and includes the Awards/Hall of Fame Banquet Dinner. 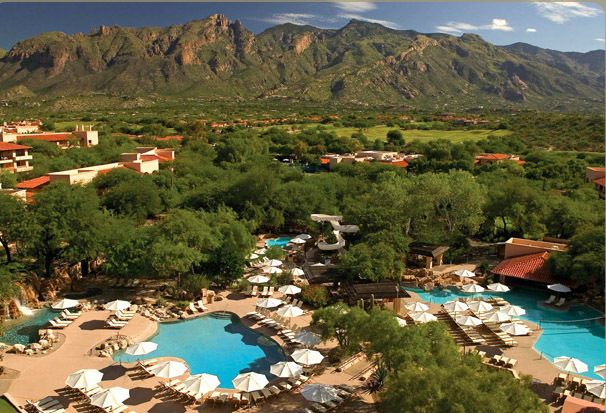 The host hotel for this year’s USTA Southwest Annual Meeting is the Westin La Paloma Resort and Spa. Located up against the Catalina Mountains, this Four Diamond resort is one of the nation’s finest, and a true gem of Tucson. The resort has five gorgeous swimming pools, a 27-hole Jack Nicklaus signature golf course, Elizabeth Arden Red Door Spa and 10 championship tennis courts (four clay, six hard, eight lighted for night play). The facility, which opened in February 1986, has been a past home to USTA National Meetings (March 2007), and has garnered many awards for travel and service, including a near-annual selection as one of TennisMagazine’s Top 50 Resorts in the United States. A terrific room rate of $119/night (plus taxes) is available to USTA Southwest Annual Meeting attendees. The facility is located in the heart of Tucson up against a breathtaking backdrop. Payment for the 2011 USTA Southwest Annual Awards and Hall of Fame Banquet is $60 per attendee, and includes the Southwest Tennis Foundation Silent Auction Fundraiser. USTA Southwest annually honors its top performers in several different volunteer and player categories, and these selections are the cream of our crop and represent the best in Southwest community tennis. Help us honor those servicing the Southwest, as well as our two newest Hall of Famers – Donald Ball (top, in photo) and Timothy Russell. To learn more about these men and their contributions to Southwest tennis, click HERE. 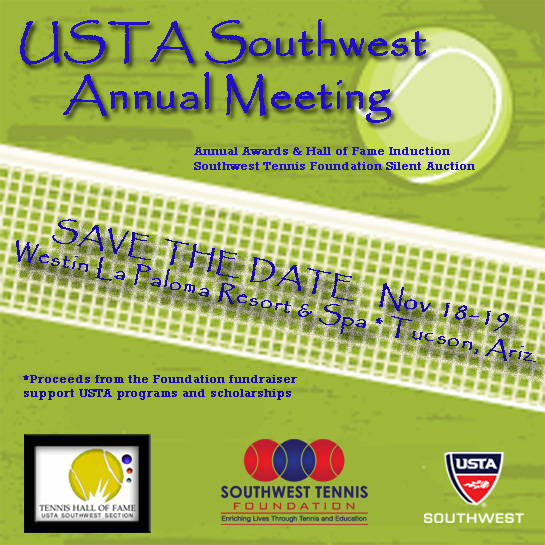 Award winners and Hall of Fame inductees will be recognized on Saturday, Nov. 19 from 6 – 9 p.m.
2011 USTA Southwest Award winners will be announced in late September. Payment for the Annual Awards and Hall of Fame Banquet is $60 per person. 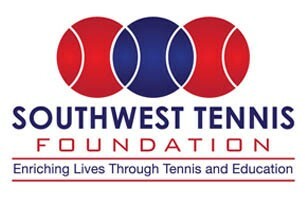 If you can’t attend the USTA Southwest Annual Meeting/Annual Awards & Hall of Fame Banquet, we hope that you will consider donating to the Southwest Tennis Foundation. The Southwest Tennis Foundation is the charitable arm of the Southwest, and, as such, is always in search of contributions from tennis lovers to help sustain its good works in local communities across our area. The Foundation will hold a special Silent Auction after the Awards/Hall of Fame Banquet with several cool items and prizes to help raise funds for tennis programming. Proceeds from the fundraiser go toward assisting grass roots tennis organizations, travel and training grants for juniors as well as need-based college scholarships for deserving young tennis players – all from the Southwest. Help us support that effort by donating online. Even small amounts go a long way to help us sustain and fund these terrific endeavors. There is a special option at the top of the page to make a $5 contribution to the Foundation on top of your fee for attending. Please consider donating! SPONSORS: If you are interested in sponsoring this great event or in assisting us with quality raffle items, please contact USTA Southwest Marketing & Communications Manager Jeff Sikes atsikes@southwest.usta.com or 480-289-2351 x. 109.